Ever wish you could take your old DVD collection and zap it into the “cloud”—perfect for watching your favorite movies on any device you want, whenever you want? That’s the promise behind Vudu’s new “disc-to-digital” service, which scans DVD and Blu-ray discs from your home collection and adds digital copies of your movies—well, some of your movies, anyway—to a cloud-based digital locker. Even better, you can opt to convert selected DVD movies to 1080p “HDX” video quality—not quite the same level of sharpness as Blu-ray, but pretty darn close. You can add your old DVD discs to your “My Vudu” digital locker, and even upgrade them to HD—for a price. Naturally, though, there’s a catch—several of them, actually, starting with the fact that Vudu’s “disc-to-digital” service isn’t free. For starters, you’ll need to sign up for a free Vudu account (Vudu, by the way, is the maker of one of the first streaming TV set-top boxes, and it’s now owned by Wal-Mart), and you’ll also need to register with Ultraviolet, a video-streaming “standard” established by five of the biggest Hollywood movie studios. 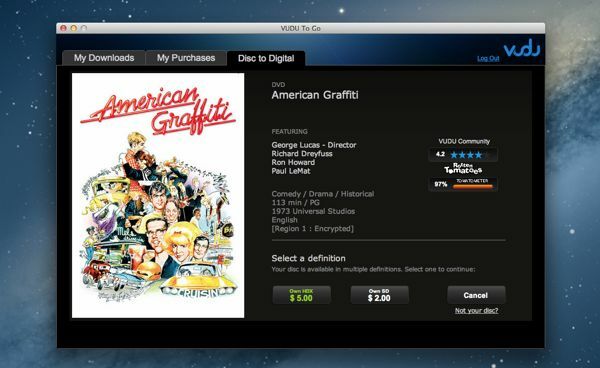 Once you’re all signed up, you’ll be prompted to download Vudu’s disc-to-digital utility, versions of which are available for both PC and Mac. I downloaded the Mac version, and the installation process took only a few minutes. It takes less than a minute for Vudu to scan and identify a DVD, but prepare to pay up before adding the movie to your digital locker. It takes less than a minute for Vudu’s software to scan and identify a disc—and if it finds a match in its massive database of digital movies, you’ll get the chance to instantly add the movie to your “My Vudu” archive. And here’s comes the first catch: Vudu charges $2 for every DVD you add to your digital locker, and that’s if you choose the SD (“standard definition”) version of the movie. 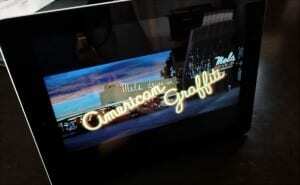 Want to pony up for the HDX (high-definition) version of a DVD? That’ll be $5, please. Meanwhile, adding a Blu-ray disc to your Vudu lockers costs $2 for the digital HDX version. You can watch your Vudu disc-to-digital movies on an iPhone, iPad or Android tablet, but only in SD. Once you’ve added some movies to your Vudu locker, you can watch them on your PC or Mac using the same “disc-to-digital” program you just downloaded. Vudu also offers streaming video apps for iPhone/iPad and Android tablets (which can only play the SD versions of your Vudu-converted movies, by the way), as well as apps for the Xbox 360, PlayStation 4, and Roku. Apple TV still isn’t supported, although you can try streaming your Vudu movies (in SD, mind you) from your iPad to Apple TV via AirPlay. Now, here’s another catch: there’s a good chance that only some (and perhaps even just a fraction) of your DVDs and Blu-rays can be added to your Vudu locker. Why’s that? Well, to begin with, only five of the six big Hollywood studios—Sony, Universal, Paramount, Warner Bros., and Fox—offer movies through the service, with Disney being the lone but notable holdout. In other words, don’t count on converting any of your “Pirates of the Caribbean” DVDs to your digital Vudu locker anytime soon. Many of my DVDs—including “Star Wars,” “Indiana Jones,” and “Jaws”—were “not eligible” for transfer to my Vudu movie locker. And even if you are trying to add a movie made by one of the other five studios, a given film must still have been “legally cleared” for streaming via Vudu. Example? Well, I had no problem adding my “American Graffiti” DVD (from Universal) to my Vudu locker, but when I tried adding “Star Wars” (Fox), I was curtly informed that the movie was “not eligible” for conversion—and I got the same answer for such high-profile titles as “Raiders of the Lost Ark” (Paramount), “Jurassic Park,” (Universal), and “Jaws” (ditto). Still, several other DVDs worked fine, like “Star Trek II” (Paramount), “The Maltese Falcon” (Warners), and “North by Northwest” (also Warners). I should also mention that my new HDX version of that classic Hitchcock thriller looks splendid—far better my old standard-definition DVD version, in fact. Got any questions about Vudu’s “disc-to-digital” plan? Let me know in the comments below. You can search Vudu’s library of available disc-to-digital movies right here before going to the trouble of downloading the software.